For those not already familiar with the terminology, the software tool “Image Resizer for Windows” is what’s called an Explorer Shell Extension (aka ShellEx). When you install it on a Windows PC, it adds to Explorer’s capabilities. Thus, if you can puzzle your way into the screen capture to the left (which I resized using the very tool I’m writing about at the moment), you’ll see that an entry in the right-click Explorer menu called “Resize pictures” has been added to call put this utility to work. Selecting that menu entry produces the Image Resizer window that appears beneath the menu snippet, and shows that you can pick any of a number of default resizings (small, medium, large, or mobile). You can also create you own custom resizings as well (as I typically do for my blog posts, which are limited to 500 pixels in width, maximum). 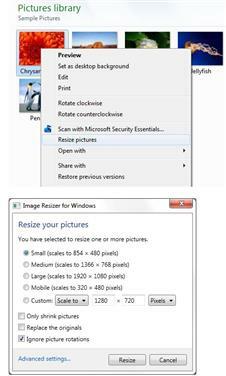 For anybody who must work with images or screen captures on a regular basis, Image Resizer for Windows is a great add-in for their software toolbox. It’s a CodePlex project so it’s Open Source, free, and safe for general and widespread use. There’s even a server version that’s based on ASP.NET available through imageresizing.net. And for those whose memories go back far enough, yes indeed, this is a faithful replacement for the old Windows XP PowerToy also named Image Resizer. It’s pretty popular, too: according to the CodePlex home page for the tool, it’s been downloaded over 1.4 million times. Working with Shell Extensions can sometimes get interesting on Windows PCs. Because I’m advocating adding one in this blog post, I also feel compelled to mention Nir Sofer’s outstanding tool for viewing and managing Windows Shell Extensions in this connection. It’s called ShellExView (currently at version 1.86) and it, too, is a nice, compact, and free tool for Windows PCs. I’ve used it many times to identify and root out shell extensions I no longer use, or didn’t want, and you may be able to do likewise as well. Worth downloading.